Rent our multi-purpose stage to create a custom stage in the exact size you want! For use indoors or outdoors, we have delivery and setup available. 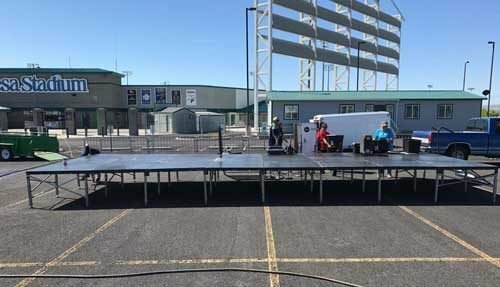 Our custom-sized, multi-purpose stage is simple to set up and easy to transport! The stage comes in 4′ x 4′ square sections, and you build the stage how you want it! We provide options for guard rails and stairs as well. Our platform staging works great for performances or concerts, or for any other purpose your event requires. For use at your inside or outside event! 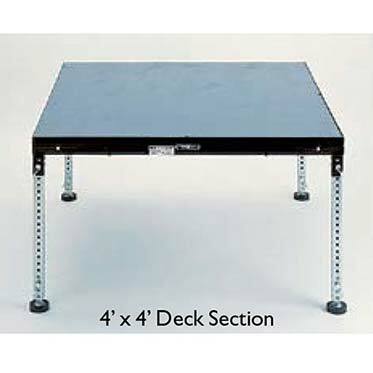 For indoor venues, we set up with rubber feet to prevent slipping or scratches on flooring. We serve Pasco, Kennewick, Richland, and the entire Tri-Cities, WA surrounding area. 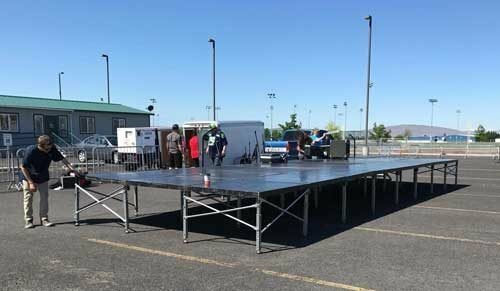 We offer delivery and setup of the stage for an additional charge (fee determined on a case-by-case basis). We’d be happy to discuss your options with you! Call us to reserve a stage for your next event!